Happy Monday! Or seeing as it’s almost 10am and I’m still feeling groggy…it’s Monday. I hope you had a great weekend with some St. Patrick’s Day fun. It was absolutely gorgeous here and from the weather report it looks like spring is here to stay. I wore this outfit Thursday for an early start to the weekend. We went to BLT Burger (you must try one of these burgers if you are in NYC, they are fantastic!) and sat at the bar to take in the March Madness action. The server was incredibly sweet and said she loved how I dressed up my shirt with a “girly necklace.” As grateful as I was for her thoughtful compliment, my mouth was completely full of burger goodness so all I could do was nod and somewhat snort while trying not to choke- very stylish. This entry was posted in DIY, Outfits. Bookmark the permalink. 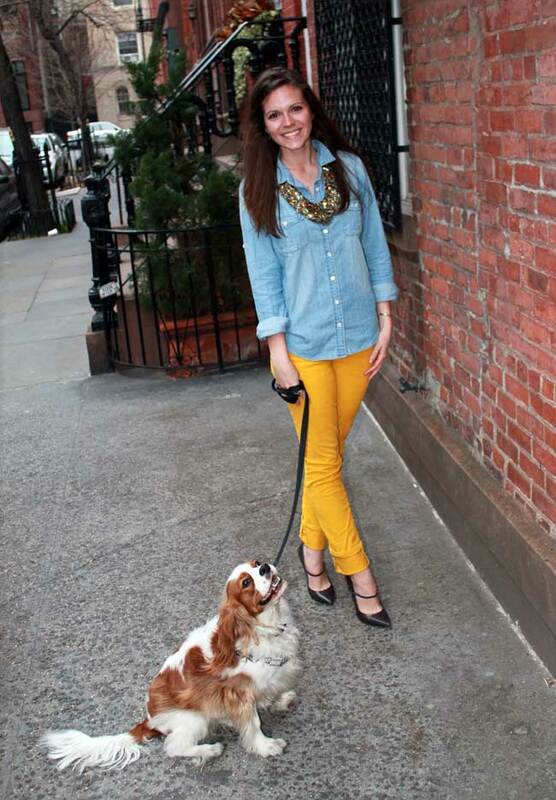 Love how you styled those gorgeous yellow pants. And your dog is adorable! 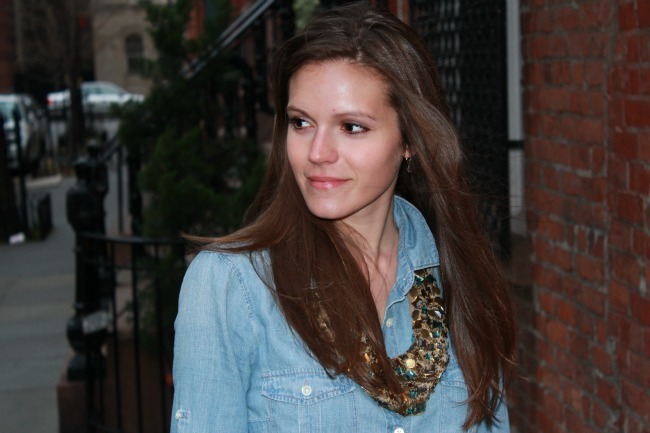 I have the same chambray top and I wish I could wear it EVER SINGLE DAY! It goes with everything!! Great post. She was right, the necklace is gorgeous! You look so pretty. love the outfit.. the pants and shoes look great.. love the necklace.